Cameron chats to Bev while she is being set up on the static cycling machine. It automatically adjusts to effort, so when you tire, it keeps your limbs moving. After a cuppa (one of the 10,000 consumed at the centre in a year!) marvel Fundraising Manager Samantha Harper explained how the 11 staff and over 100 regular volunteers make life with MS easier for patients delivering more than 10,000 treatments to 400 families every year. Rose is the inspiration for our crossing and standing here with her as a team makes us really proud: Rose, when we face hardships, we’ll look back at you. Deirdre being ‘air lifted’ onto a treatment bed so she can begin physiotherapy treatment. 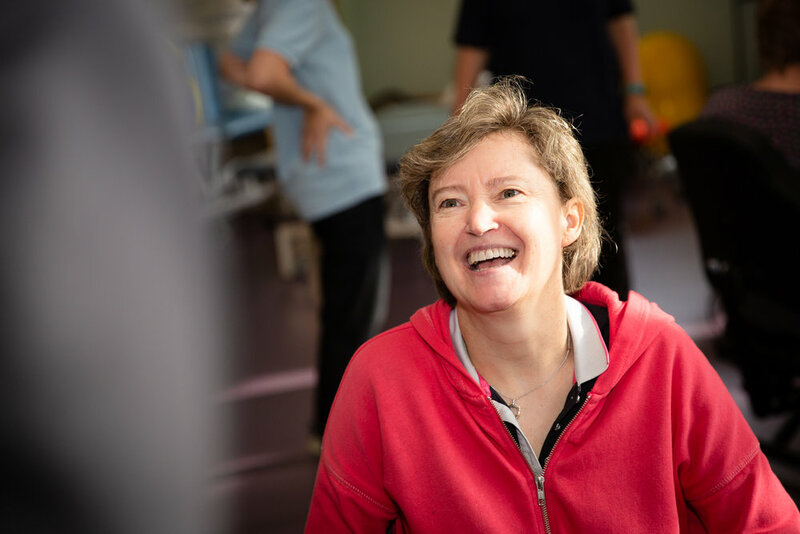 BMSTC is particularly important to Atlantic Discovery, as it has been Rose’s second home since she was diagnosed with MS nearly two decades ago. She visits at least once a week and is enormously grateful to the steadfast team for all their love and support over the years. It was Cameron’s first visit to the Centre and he was deeply moved by the experience and shared this with Rose. ”Nothing makes me more proud to have met you and your incredible son Ben and learned how you both stand so tall and fight this hand you’ve been dealt. It moved me so much to understand better what MS is all about and left me wishing I could rub it all out. So terribly sad. It left me never wanting to take for granted what we have. “And when you said goodbye to me you wouldn’t let my hand go. I didn’t want to let your hand go either. Atlantic Discovery was treated to smiles and laughter from everyone at the centre. 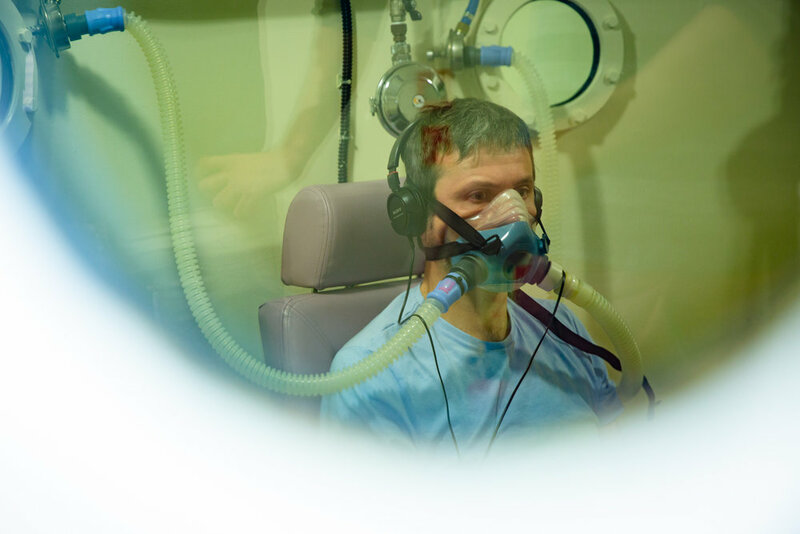 David receiving oxygen therapy in the oxygen chamber. This is how far we are with fundraising for BMSTC. Atlantic Discovery has set a target to raise £30K for registered charity BMSTC, which was set up by people with MS. They have delivered quality support to the local MS community for 34 years. They are a self-funded and rely on fundraising and donations to meet their annual running costs of £400K. The money Atlantic Discovery will raise will cover their operating expenses for the duration of the row and will likely be their largest donation received in the year. Ben, Jack and Isaac pictured here in the walk-in oxygen chamber at the Centre. An hour of oxygen is delivered to BMSTC members at higher pressure to speed up oxygen absorption into the blood stream. Our second chosen charity is the MS Society. We would like to raise £30K towards research for a cure for MS. Imagine a world free of the effects of MS? So far the MS Society has invested £155m in world-class research and have made incredible breakthroughs. Ben, Isaac and Jack entered the BMSTC Santa Run in Reading last year, and Atlantic Discovery and a few family members have decided to support it - running 5K in Santa (Swim) Suits in La Gomera, in between race preparation, to raise funds for this amazing charity. We’ll doing the run on Saturday 8 December at 8am. Have a look on our Facebook page to see this hilarious sight live on the day. Please show your support for this crazy initiative by making a donation here. 100% of your donation will go to BMSTC. Ben summed up his feelings for the BMSTC community. “The people who make up this Centre are something special. They are a constant rock for those whose lives have been turned upside down.